As a way of re-kindling my interest in adding some regular blog content, I thought I’d write about my recent ARPS success. The Royal Photographic Society have three levels of distinction, all of which carry credibility in the photographic world. I did the first level, the Licentiate, in 2016 for some personal development in my photography. I needed to submit 10 images that showed a sensible level of photographic competence. Happy with passing that, I moved onto preparing for the Associate level of distinction. For this award you needed to submit a set of 15 images that hung together coherently and showed a variety of aspects of your chosen theme. A statement of intent was required that explained the message that you were trying to get across. My panel was entitled “Alpine Ski Touring”. 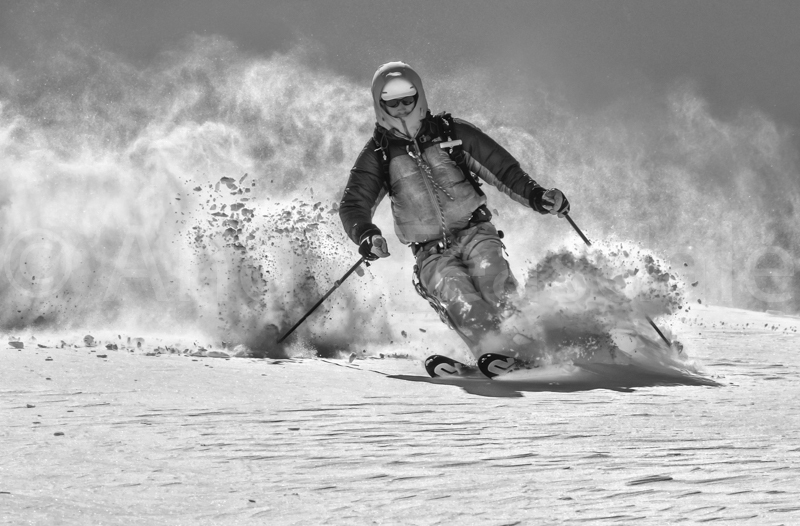 As you can imagine, being out in the mountains skiing with fun people and taking the photographs is brilliant. That is something that I just do and I had a pretty good library from which to select my panel. I printed and mounted the panel myself and posted it of to the RPS in Bath for an assessment date that I was unable to attend. It didn’t pass!! However, I found out later that the subject matter and content was very good, but there were a few technical flaws in my processing of the images., mainly over sharpening. So, I got to work, reprocessing the offending images applying virtually no sharpening and tried again. Damn!! It failed again. How?? I asked the assessors at break time what I was missing and they pointed out some white line halos around certain parts of the subjects. Wow, I hadn’t noticed these flaws and struggled to see them without a magnifying glass, but they did exist which meant that my images didn’t make the cut. The drive home was one of mixed emotions; joy that the assessment team thought that my images were great and worked well as a panel, a little upset that I hadn’t noticed the halos and more joy because I had learned how to fix the problem!! So, I better have another go!! I went to Bath in October, with the offending images carefully re-processed and printed. I was a bit more gripped this time because I knew that I had done everything that I could do, or atleast knew that I could do. The assessors were very happy this time and they seemed as pleased as me when they announced that I had passed. The drive home this time was full of yeehaa’s and ear to ear grins!! Was it worth it? Massively so! I learnt a lot about processing images which was good, but more importantly to me I realised that my personal choice of images was good enough to tell my intended story. It was a delight to find out also that my printing and mounting skills cut the mustard!! The next stage, Fellowship, is a way off. I have a concept, but a lot of work to do in getting suitable and sensible images. All good for more photographic development. PS. The RPS have recently published my ARPS panel on their website. If you’d like to see my whole panel, please follow this link. You might need to copy and paste into your address bar. Thanks. Well done Andy, your photos are exceptional and get better and better exponentially. No reason that you shouldn’t be FRPS. Hi Colin. Just found this message, many thanks!! Happy New Year to you. I am adding a link to the RPS website that has all of my panel on display. Someone might be interested!!! I don’t blog very often, perhaps I ought to do something about that!! I hope all is well with all of you, I guess you’ll be having a very snowy festive season. All the very best for a wonderful 2018. Cheers for now, Andy.